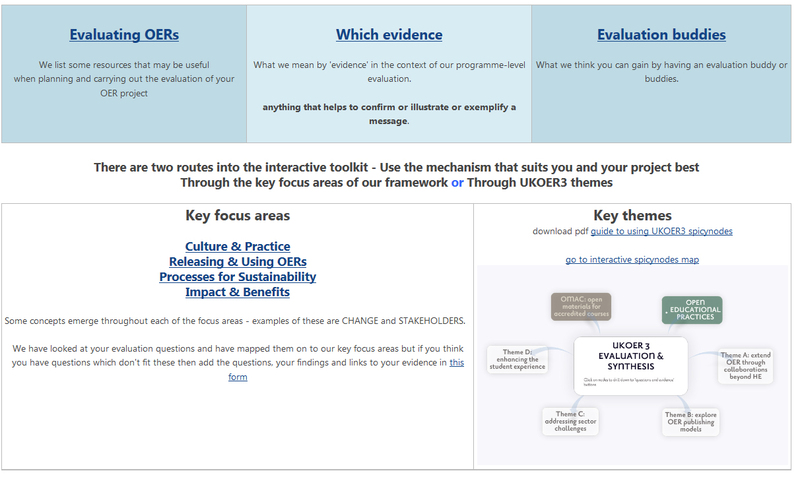 We are delighted to launch our new Evaluation Tookit which aims to benefit UKOER projects by providing a structured way to collate their findings and observations and can also be used in the reporting process. It also provided lots of information, advice, examples and videos, on evaluation, sources of evidence, and buddying. To help projects get the most out of the toolkit, we have produced a guide. The interactive element of the toolkit provides two alternative routes into the structure – through the programme themes, or through key evaluation focus areas. Both routes utilise the same underlying mechanism to record findings, observations and evidence – a series of google forms and spreadsheets – but the higher level user interface is very different. The key focus area route, via links on dedicated wiki pages, is useful for those familiar with our evaluation framework. Each focus area has an individual wiki page which provides a description of that area and some specific issues and aspects that the programme is investigating. The programme themes route offers a more visual approach via an interactive mind map (using spicynodes) where you can explore the themes of the UKOER3 programme and drill down to find the specific issues and aspects that relate to the themes you are investigating. We have produced a quide to using the spicynodes maps. Whichever route projects choose, they can opt to receive an email record of their entries for future reference and report writing. As projects approach writing their interim reports, we hope this provides an opportunity to reflect on, and perhaps reframe, the evaluation questions they started with, in the light of experiences to date, as it becomes clearer where their valuable contributions lie. We welcome feedback on the toolkit, and expect to revise and improve it in the light of comments. Posted by isobelfalconer on March 23, 2012 in evaluation, UKOER Phase 3 and tagged evaluation, tookit, ukoer3.